SHARPEN YOUR CRITICAL THINKING SKILLS AND IMPROVE PATIENT CARE. Experience with clinical cases is key to mastering the art and science of medicine and ultimately to providing patients with competent clinical care. 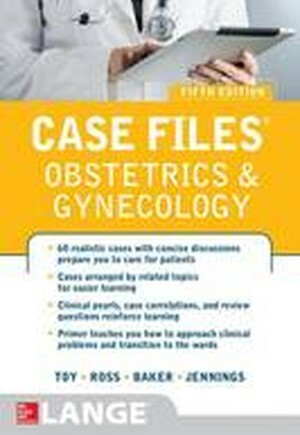 Case Files(R): Obstetrics & Gynecology provides 60 true-to-life cases that illustrate essential concepts in obstetrics and gynecology. Each case includes an easy-to-understand discussion correlated to key concepts, definitions of key terms, clinical pearls, and USMLE[registered]-style review questions to reinforce your learning. With Case Files[registered], you'll learn instead of memorize. You will: learn from 60 high-yield cases, each with board-style questions; master key concepts with clinical pearls; cement your knowledge with 25 new integrated challenge questions; polish your approach to clinical problem solving and to patient care. It is perfect for medical students, physician assistant students, nurse midwife and nurse practitioner students.